Jakarta History Museum located in the historic Old Jakarta Kota area, Taman Fatahillah square offers three of the city’s most interesting museums. Once the heart of the colonial administration in the 18th century the square underwent a major restoration in the 1970’s. A fountain in the middle of square once as the main water supply for the former colonial capital. The Portuguese cannon on the north side of the square is reportedly an impressive font of fertility. Jakarta History Museum is the one displaying the history of the development of the City of Jakarta, both the events and the community, from the prehistory until these present days. This museum is located in a building of cultural property which in the past known as Stadhuis, the City Hall of Batavia. As written on an inscription of the Museum collection, the building was constructed in 1707 by the city government of Batavia during the period of VOC and Governor General Abraham van Riebeeck inaugurated it in 1710. This building is located in front of a park, which in the past was known as Stadhuisplein, the City Hall Park, and now it is called Taman Fatahillah. Since 1970, the surroundings of Taman Fatahillah have been declared as Cultural Property and it was totally preserved. This effort was the beginning of the development of the historical area of the City of Jakarta, carried out by the Government of DKI Jakarta. The Museum of History of Jakarta was inaugurated on 30 March 1974 for being the center for collection, conservation and research for all kinds of objects of cultural property related to the history of the City of Jakarta and at the same time becomes a center for education, study and recreation for the community. Due the very long course of the history of Jakarta, the collection of this Museum are highly varied in shape and consist of objects being the heritage of the prehistorical period until the beginning of the 20th century. There are another replicas of the Tugu Inscription from the age of Great King Purnawarman, forming evidence that the center of the Kingdom of Tarumanegara was located in around the seaport of Tanjung Priok. Further, a map of the 16th century and the replica of the Padrao monument of the Portuguese represent the historical evidence of the age of Sunda Kelapa Harbor. 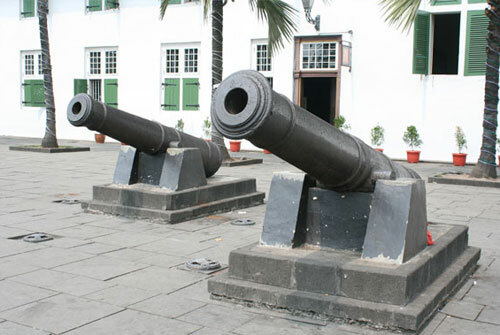 The period of Jayakarta is the beginning of the establishment of the City bronze cannon and through various drawings and maps of the 17th century. Furniture collection of Betawi style from the 17th, 18th and 19th century is the richest collection and belongs to the most complete one in the world. This collection is very interesting since the association reflects of the community of Batavia City with various cultural elements from Europe, especially Dutch, China, India and Indonesia.